The career of David Hare has spanned 40 years and over 25 plays – rich pickings then for Sheffield Theatres’ season showcasing the man’s work. Three of Hare’s finest works are to be performed at the Crucible and Lyceum throughout February, of which Plenty is the curtain-raiser. The play, first premiered in 1978, is an ambitious and sweeping work, spanning nearly 20 years and set in three different countries. It tells the story of Susan Traherne, a former secret agent who worked in France during World War II, who is having difficulty in coming to terms with her rather less exciting post-war life. Traherne is a lost, fragile, soul desperately searching for her own identity – whether it be attempting to have a child with a virtual stranger or becoming part of bohemian culture in London’s Pimlico. She marries a diplomat but cannot bring herself to play the dutiful wife that his position dictates she be, and constantly hankers after the airman she fleetingly met in France one eventful evening. 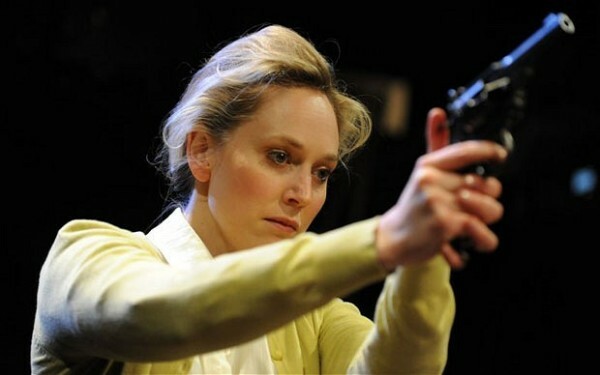 Hattie Morahan perfectly encapsulates Traherne’s sense of ennui, but with a manic energy never far from the surface. She’s onstage for virtually the whole play and is utterly convincing throughout – whether it be wielding a gun at a suitor or attempting to pass herself off as a grieving widow to the diplomatic corps. Morahan is supported by an excellent cast – Edward Bennett makes an immediate impression by entering the first scene stark naked and covered in blood, but also gives a wonderful performance as Raymond, the diplomat who attempts to heal Susan’s fragile mindset. There’s also strong performances from former Eastender Jack Ryder, and Kirsty Bushell as Susan’s best friend, but the veteran actor Bruce Alexander steals the play with a hilarious portrayal of a pompous Ambassador. The intimate setting of the Crucible’s Studio means that Plenty is a difficult play to pull off – the sheer breadth of its ambition seemingly tailor made for a bigger stage. Yet director Thea Shorrocks (Olivier-nominated for her direction of Rattigan’s After the Dance at the National) only confirms her reputation as one of theatre’s most exciting young talents: the pacing is quick, with costume changes often taking place onstage, and the minimal amount of props onstage. Hare’s play too gives much to think about. Traherne’s desperate search for identity mirrors that of post-war Britain – there’s mention of the Suez Crisis and talk of the ‘death rattle of the ruling classes’, as the British Empire continued its post-war decline. It’s easy to see why Plenty is now regarded as one of Hare’s best plays. It’s true that Traherne is often an unsympathetic,complex character, and the non-linear chronology could leave the more easily distracted viewer confused, but rapt attention brings its own rewards and Plenty is a play that will stick in the memory for days, if not weeks, afterwards. Sheffield Theatres’ David Hare season will continue with productions of Racing Demon and The Breath of Life.